The team behind the project are currently selling a special soundtrack for the game. It contains all 35 tracks from the game, original artwork by Legends artist Hideki Ishikawa, and brand new music from Legends composer Makoto Tomozawa. 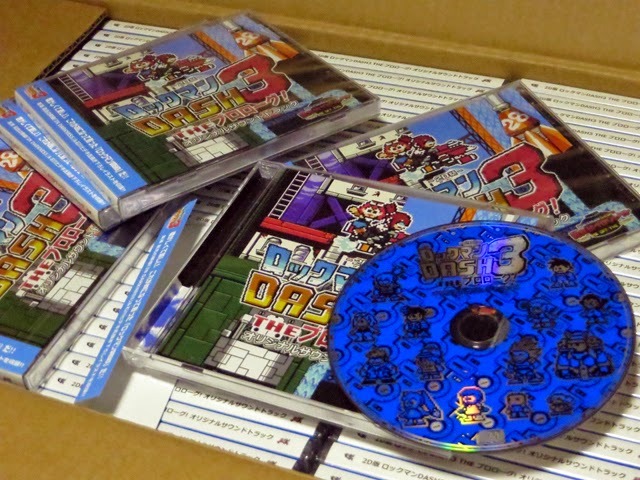 What's more, the CD will contain a copy of the game (again, available for free download at a later date). The whole kit and kaboodle will run you $35 (includes shipping from Japan). To order, send inquiries to dash3reboot@gmail.com. PayPal is also acceptable, via the corresponding address. If you'd like to get your CD sooner, expedited shipping is available for an additional $10. This is a passion project for fans, by fans -- if you're a Legends nut, you don't want to miss this! UPDATE: The CDs have sold out! No word on a second batch but we'll keep you posted. A special thanks to Heat Man for the info! Uh, this doesn't really concern me too much, but just out of curiosity, is it ok to sell MML anything. I mean as a fan project, without Capcom's permission, legally. The soundtrack holds no copyrighted work. It's all original material. Legal. Except it pertains to MML copyrighted material, and the fact that it has MML artwork and characters plastered all over it. Also, how do you know this, have you heard it? Not trolling, I actually want to know. If you've heard it, is there a source I can here it too? Or are you part of the team or something? Explain the hundreds of doujin Rockman albums. They're selling them because the Japanese team hired Tomozawa and Ishikawa to compose music and art for it and they need to pay the fees. That's why there are only a hundred. If they sell any more than that, it'll turn a profit. This is just keeping them out of the red. I can't. I'm asking the questions here. Um... they went under the radar somehow, Capcom doesn't care??? This'll be a fangame I pass on. Tired of the 8 bit motif that has plagued this series for far too long, especially since it's seeped into something it really shouldn't have. I will wait for a free download. I am not buying this as fanmade for their profits. Its a fan project!! No thanks. They are stealing our money for their illegally work against Capcom's permission! Waitwaitwait.... Are you actually DEFENDING Capcom? While I enjoy things being free as much as the next guy, think about the effort it took to finish this project. It'd be nice to get at least a little something for it. Maybe they had to pay the artist and composer for their contributions too. Do keep in mind that it cost them to have the CDs manufactured. They're probably trying to recoup their production costs while giving those who choose to buy a quality item. Looks to be very well made! I'm actually considering a copy...hmm. Yes!! I thought for a bit the project died. SO emailing to buy one. As much as I hate Crapcom right now, this is a fan made project that is trying to profit off of the Mega Man Legend title and trademark. Fan Made of anything isn't suppose to be sold but given freely. I disagree. People draw fan art all the time, both for free and for commission. Arguably, far more work goes into a fan-made video game, so selling it commercially seems perfectly acceptable. Not something I'm personally going to get, of course. But they have as much right as anyone else if 100% of audio and visual assets are original. Of course, if they were smart, they'd name it something else... After all, Toys for Bob had to rename Star Control II: The Ur-Quan Masters to just The Ur-Quan Masters when they made it open-source, thanks to the trademark held by Accolade Software. No they don't have the rights to do whatever they want with fan work, that infringes upon intellectual property. Doing so would make them liable for lawful repercussions, even if the material boarders on likeliness (which this doesn't, and is a straight up a Mega Man Legends fan project) it wouldn't be ideal in terms of the law to sell it, or make public use of it. Well that's how it is in US, have no idea about Japan. The ignorance is strong with many of these anons. Looks up, reads name. Yup you're right. Wasn't this the project that people were encouraged to donate to in order to get a copy of the game? I seem to remember throwing money at something like this and then never really hearing anything else from it. This is highly illegal. I expect Capcom to sue for millions in damages soon. They're selling music and including a free fan game. I don't get what the problem is.